Excess spares and inefficient processes make it difficult to establish a proper parts repair pool to keep your production environment functional with minimal downtime. Revere has a new resource called “CHAMP” that can help you manage your repair process through the Rockwell Automation remanufacturing methodology. Think of Revere’s CHAMP as your local resource to help simplify the remanufacturing transactions surrounding your inventory and act as a single point of contact for everything needing repairs, warranty, or even replacement. Revere’s CHAMP could be an integral resource as an extension of your maintenance department. The CHAMP will make regular visits and be readily available to help expedite the repair process, maximize your uptime, and escalate any repeat product family repairs. 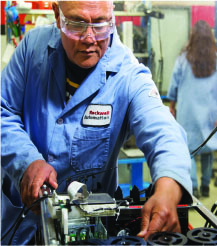 Keep in mind that Rockwell also repairs over 200,000 non-Rockwell Automation products from 7,000+ manufacturers. Contact a CHAMP today for your initial consultation.